I am a huge fan of Omnigrid rulers. I like the clarity and ease with which I can read the measurements. If I could only have one ruler for all my quilting, I would choose the 6″ x 24″ and this is the one I advise new quilters to purchase. 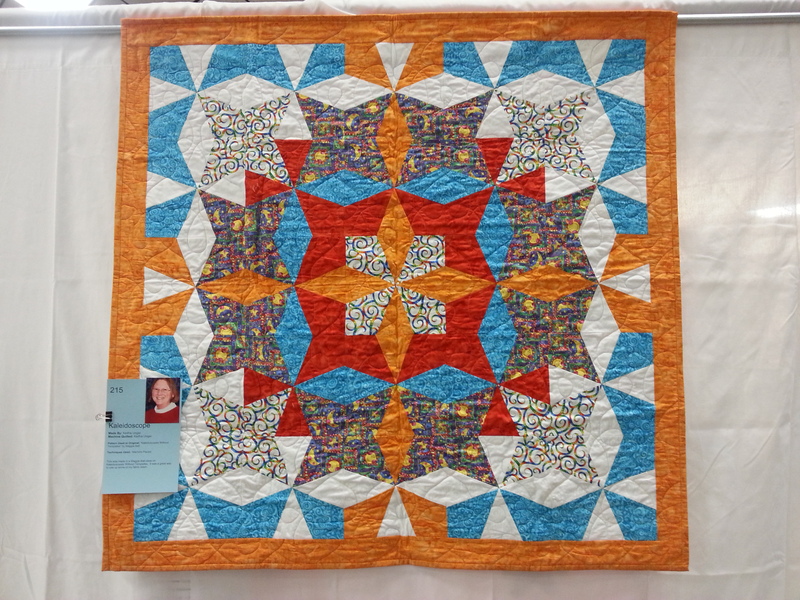 My second favorite is the 15″ square which I find extremely useful for squaring up my Kaleidoscope and Op-Art Kaleidoscope blocks. Another I like is the 6″ x 12″ ruler. 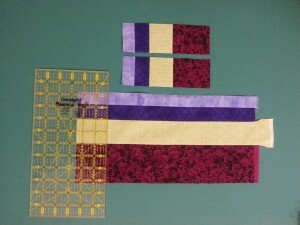 This is especially good for cutting strip sets into segments which I do frequently when making my Bargello block quilts. 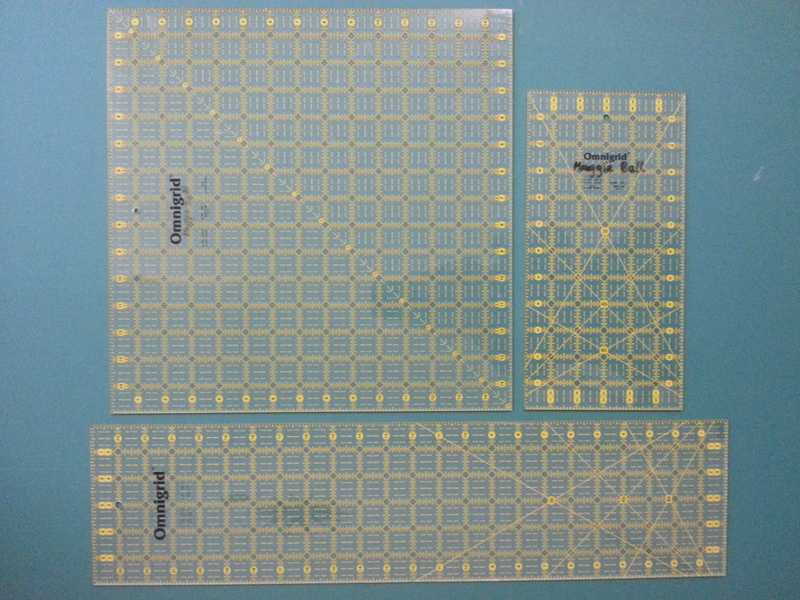 When you are making these repeated counter-cuts, it is easier to use this smaller ruler rather than the long 6″ x 24″. You can line up the horizontal lines on the ruler with the seam lines on the strip-sets which helps to keep everything square and even. On my quilting travels, I have come across a variety of rulers, some of which I have great difficulty using. Part of this is simply due to habit, but for me it is hard work using rulers that have variable divisions in the measurements marked on the ruler. I also have an aversion to rulers that have 1/2″ added on e.g. 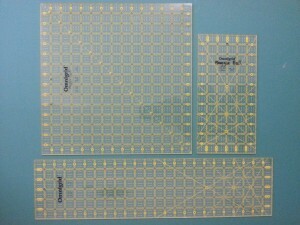 the 6-1/2″ x 24″. With my 6″ x 24″ I can either long side for measuring my cuts. For the 6-1/2″ version I get confused by the extra 1/2″ and I find it easy to make a mistake if the ruler is turned round the wrong way. I also have this problem with the 9-1/2″ and 12-1/2″ squares. However these work well for cutting blocks for applique when you want 9″ or 12″ finished size. 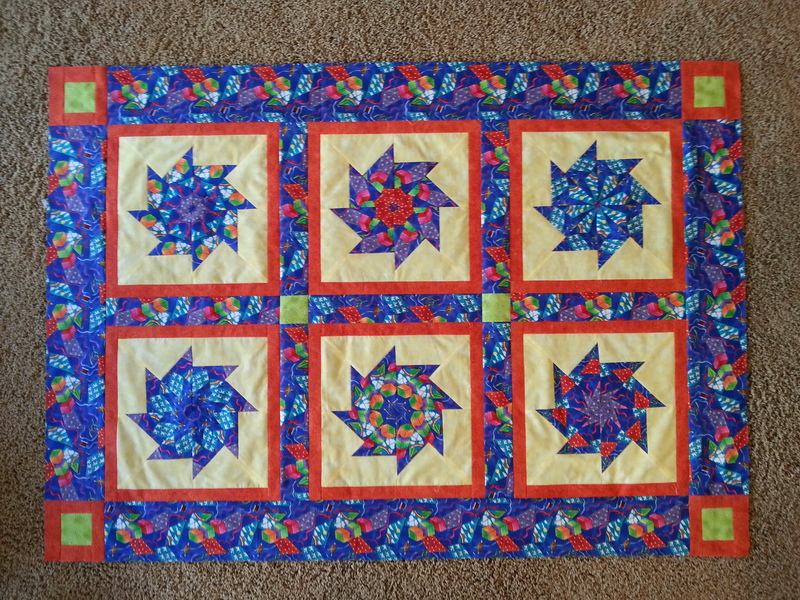 In my next blog, Part II, I’ll discuss the rulers I use when making 1/2-square triangles and 1/4-square triangles. I love teaching and a benefit of traveling to teach is that I have the opportunity to visit a variety of places. I’m always interested in seeing the local sights, especially places of outstanding natural beauty, gardens and art museums. 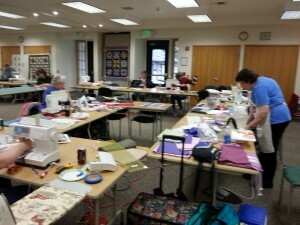 In my last blog I told you about the class I taught in Forks. 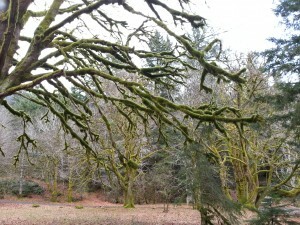 Now I’ll share some photos of the area. The Washington coast is spectacular and one of my favorite places, La Push Beach #2, is close to Forks. It’s a real treat to go there. 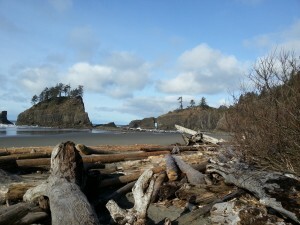 After a rainy Saturday when I was teaching, Sunday morning was bright and sunny, and I took a hike – 20 minutes through the woods to Beach #2. 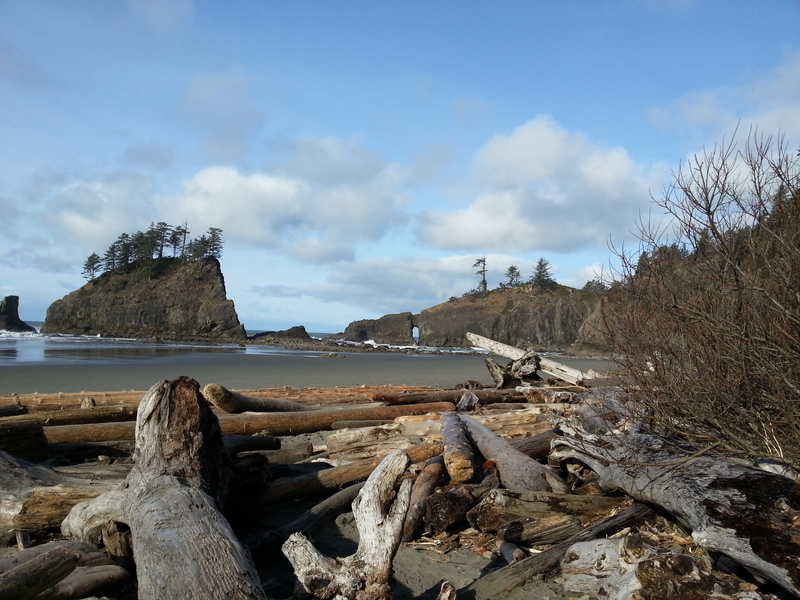 The high tide mark is covered in massive logs, which during heavy storms are tossed about and can be quite dangerous. I was there at low tide and scrambled over the logs onto the beautiful sandy beach where I peeled off my hiking boots and socks for a cold paddle in the Pacific Ocean. Here’s the view with my feet in the water. I love the reflections. Now the view looking down the beach in the other direction. As you can see, the light was spectacular and enhanced this truly magical place. After my fix of the Pacific, I set off for home. 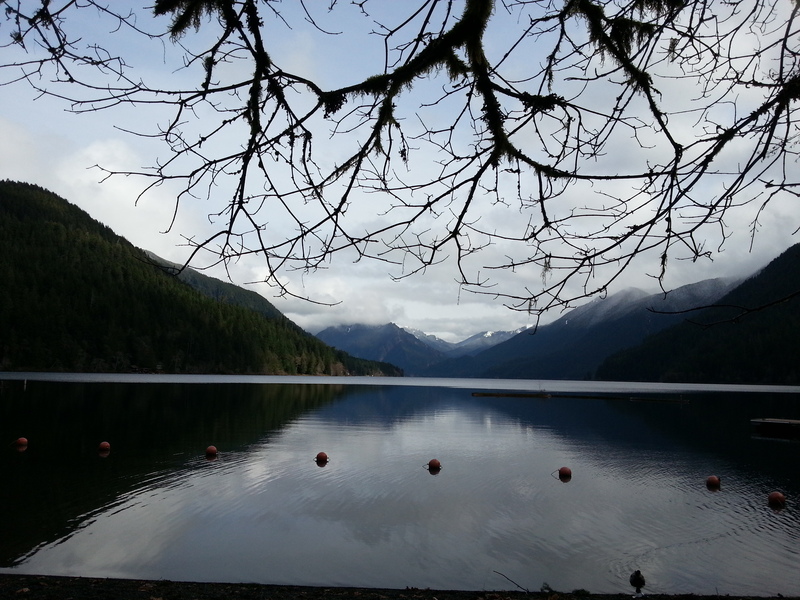 Highway 101 skirts Crescent Lake for about 10 miles. At the head of the lake, I couldn’t resist stopping to take some photos. The tops of the hills had a dusting of fresh snow and it was so pretty. 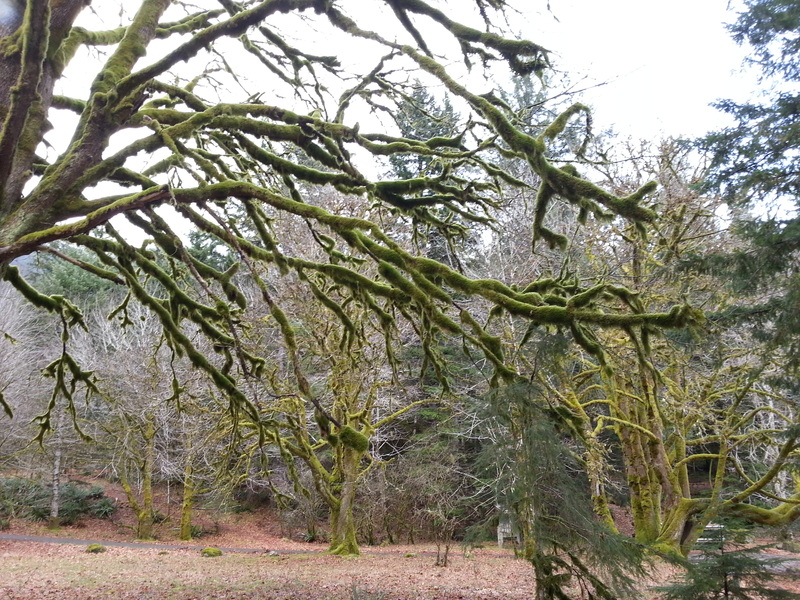 The annual precipitation is high here, (around 100″ in Forks), and the branches of the trees in this temperate rain-forest are covered in mossy blankets. 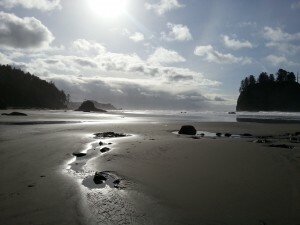 On Friday afternoon I drove 142 miles to Forks, out by the Pacific Coast in the northwest corner of WA. 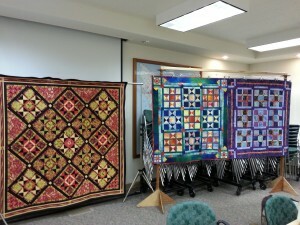 A couple of years ago, I taught at the Piecemakers Quilt Club and I was delighted to be invited back to teach again. Forks, a logging town, has received attention in recent years as the location of the Twilight series and this has resulted in a much needed mini-economic boom after the demise of logging when the Spotted Owl became a protected species. 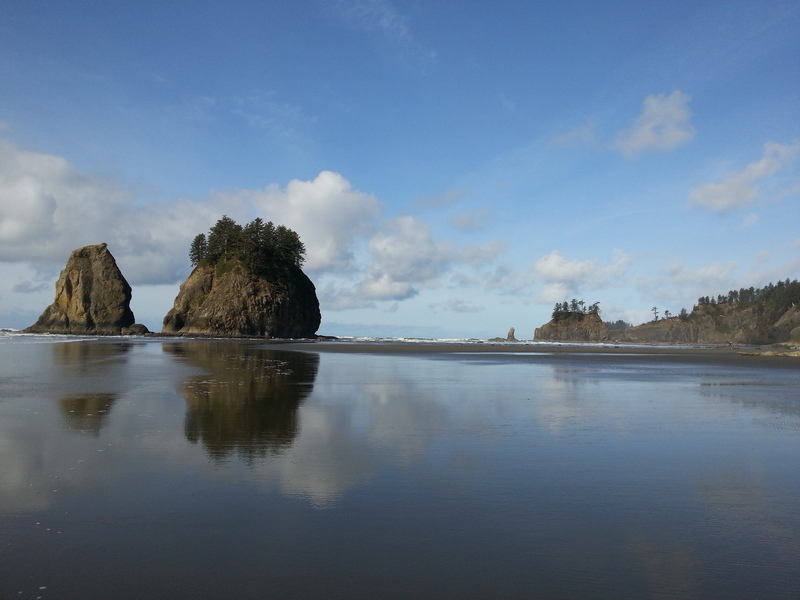 It is one of the wettest places in the USA with an annual rainfall of around 100″. 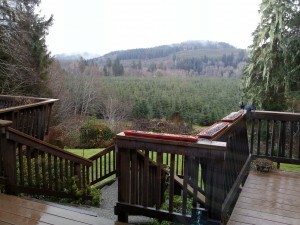 I stayed for two nights and was treated to fabulous cooked breakfasts at Misty Valley Inn. Here’s the wonderful view from the dining room complete with Steller’s Jays eating breakfast too. 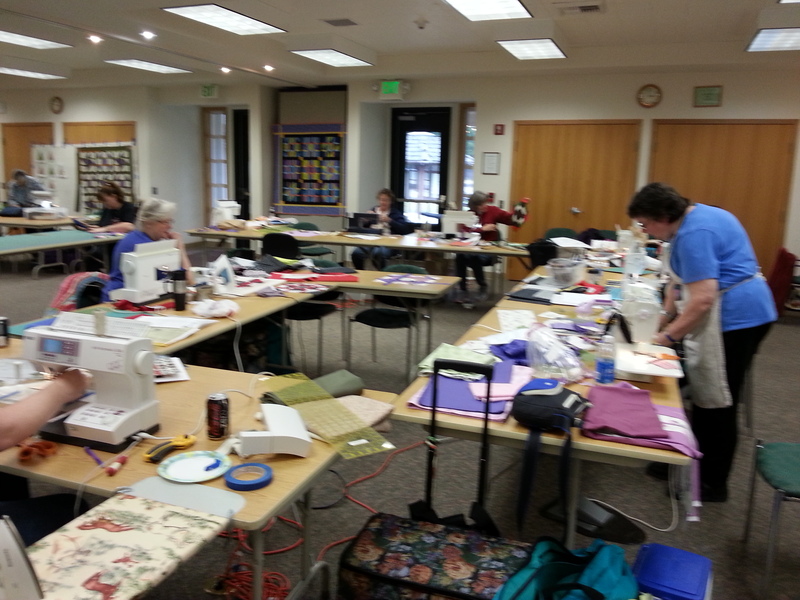 I thoroughly enjoyed the day with my students whose skill levels ranged from a new quilter to a lady with 60 years of experience! They were an easy-going relaxed group and we had plenty of laughs. 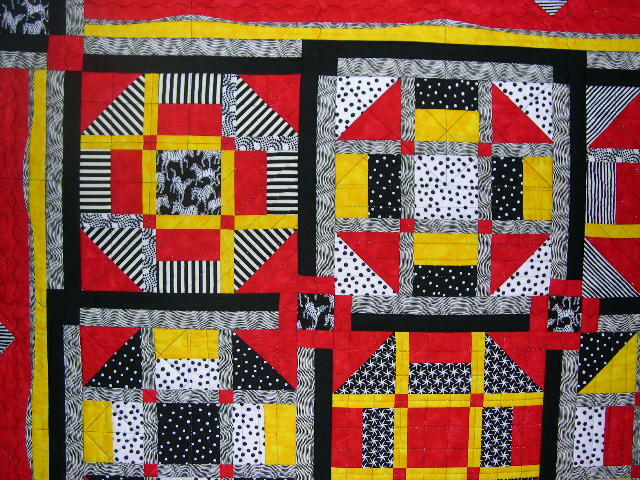 I taught my 9-Patch Lattice class – insert a lattice into any 9-Patch block to create an innovative twist and a new look. 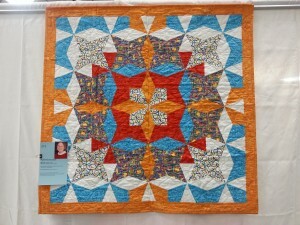 Here are some of the class samples – Ohio Stars and Simple 9-Patch. In this detailed shot of my Monkey Wrench sample, you can see the lattice more clearly. It’s fun to experiment and vary the colors in the lattice strips. Here are some of my students at work. It was spacious room with excellent lighting and everyone had their own large table. 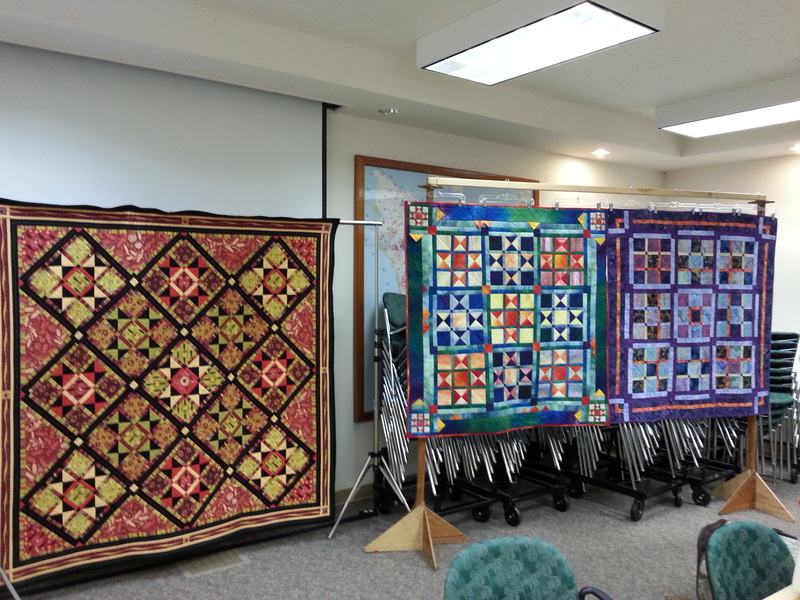 I had a sneak preview of our Kitsap Quilters Guild show this afternoon when I went to help with set up. 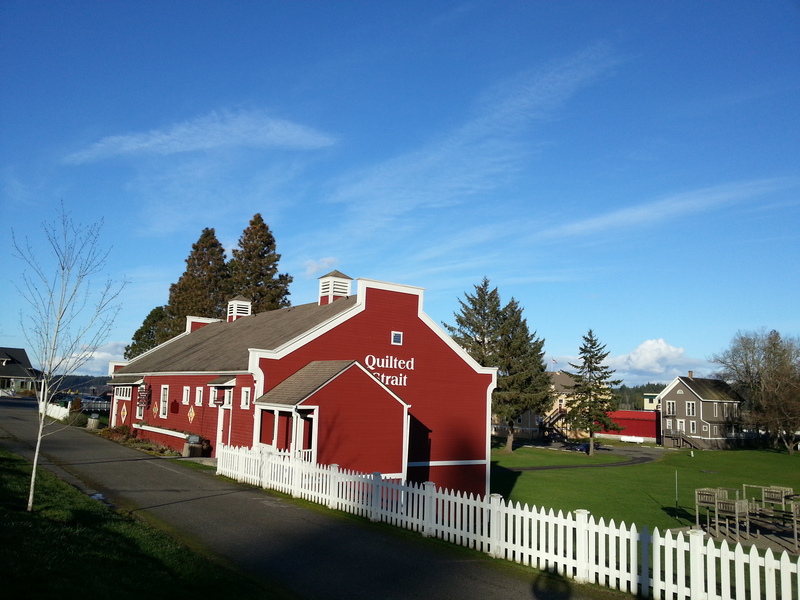 The show is at the Kitsap Fairgrounds in Silverdale, WA and will run for two days – tomorrow and Saturday (15th and 16th February). If you are in the vicinity, do stop by. 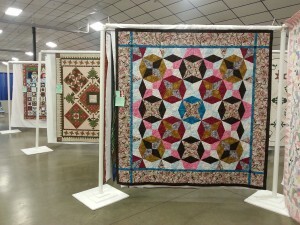 It’s a feast for the eyes with almost 200 quilts and some wonderful vendors. 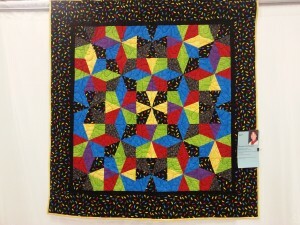 Here’s a photo of my newest template-free Kaleidoscope Puzzle quilt, Large Hadron Colliderscope, hanging in the show. 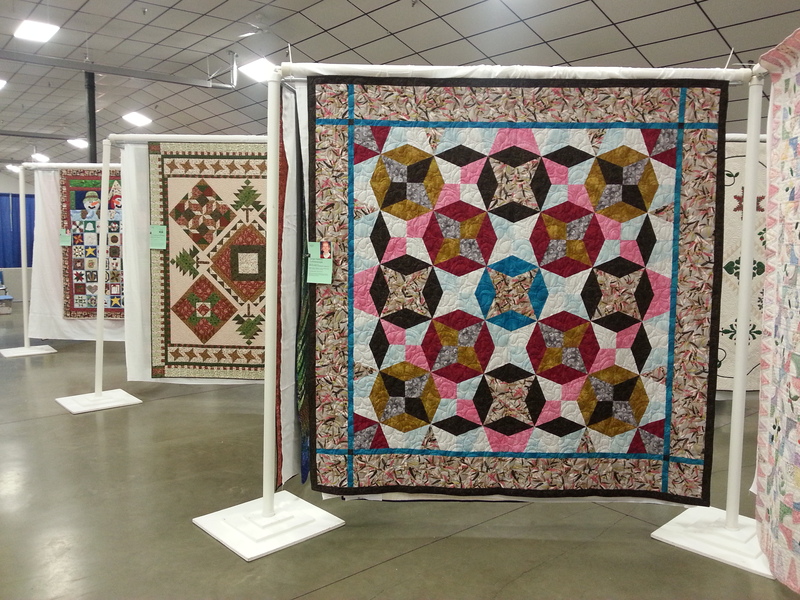 I love to see the work of my students and two who took my template-free Kaleidoscope class have their quilts hanging at the show. 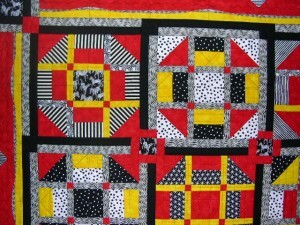 This is Amy Constant’s quilt, Mouse-Ca-Scope. 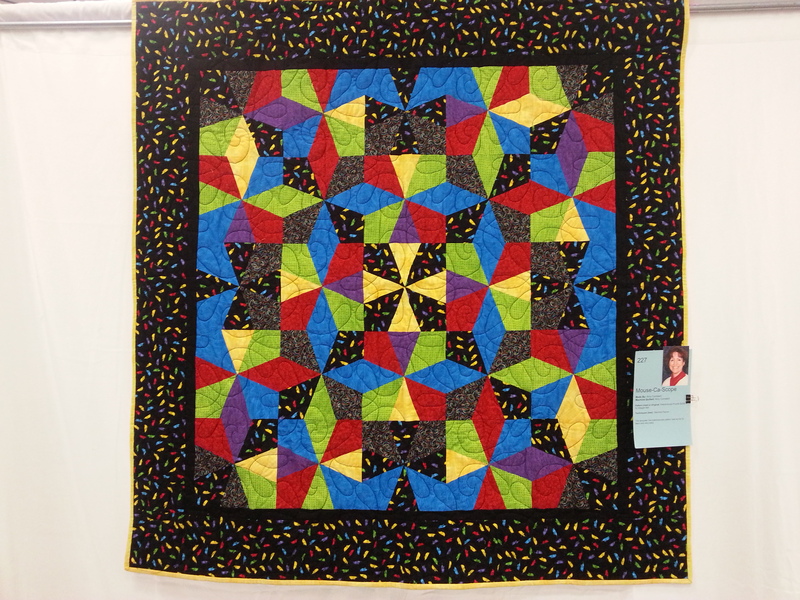 Here is Keitha Unger’s Kaleidoscope. After a winter break from teaching, I’m excited to be starting up again. Tomorrow I’ll at Quilted Strait in the lovely small town of Port Gamble on the Kitsap Peninsula, near the Hood Canal Bridge, WA. It’s a beautiful store and well worth a visit if you are in the area. Not only is there a great selection of fabric, but the owner and staff are delightful and always pleased to help their customers. This is my home base for teaching regularly and I love it. 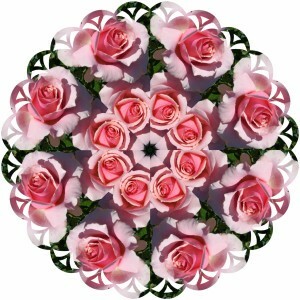 I’ll be teaching my Kaleidoscopic Pinwheels class. I’ve adapted Bethany Reynold’s well known Stack “N Whack technique so that the pinwheels float on the background. 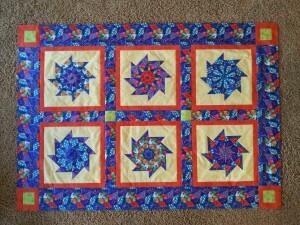 It’s fun and easy and all the blocks may be trimmed to perfect squares without losing any of the pinwheel points. This class is full and there was so much demand that I’ll be teaching it again on 2nd April. I’m excited to be launching my new website and to begin blogging. This is a new arena for me and I’m in the process of learning the technical aspects. I’m hoping to post blog entries once or twice a week, so please check back. 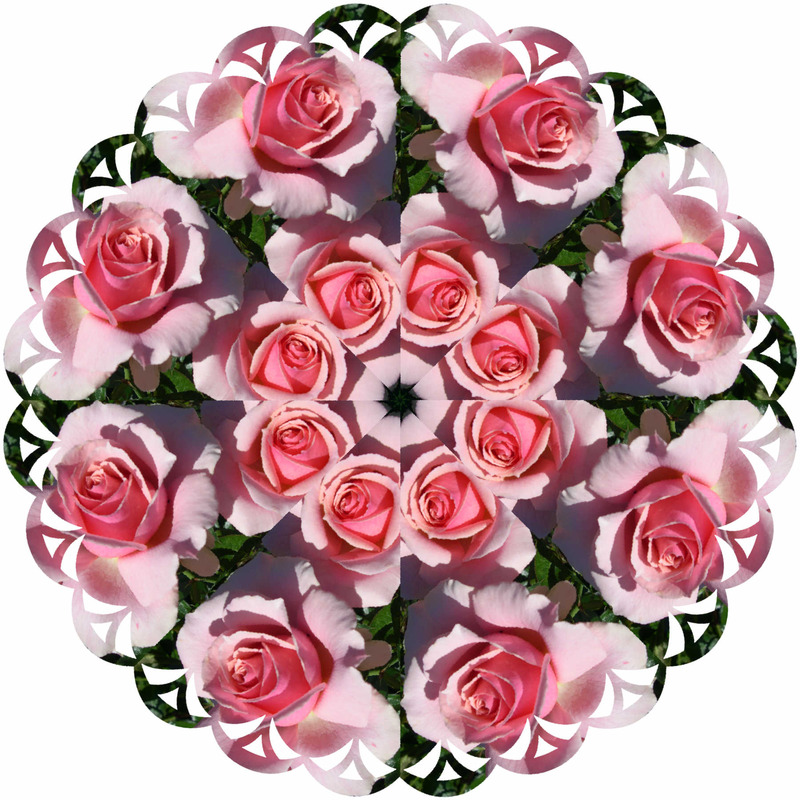 The image below was created from a photograph of roses in my garden using Kaleidoscope software.